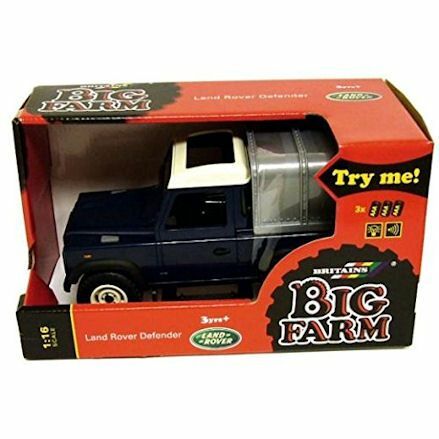 This is all we talk about here, Britains Big Farm Land Rovers as a standalone model or own one with trailers and accessories. And that is true with the Big Farm Land Rovers, still a classic with kids so no changes are needed - though they're now available with more options. 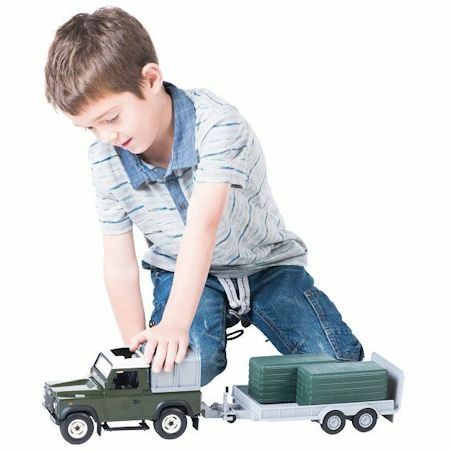 Now that we have their big toy Land Rovers in full swing, starting out with vehicle and trailer sets, before arriving at the current Land Rover Defenders. And remember, all Land Rovers have lights and sounds, so require batteries (included), have a rear hitch, active steering, detachable canopy and remarkable detail and resemblance to the real thing, but in 1:16 scale. To help you out when buying Britains Big Farm Land Rovers, we've listed all current models available to buy in the UK, so you can make up your mind from one location. Using the lights and sounds is done with a press of a button, with two very visible, easy to press buttons positioned on either side of the bonnet hood. When pressing the left button, it will go beep beep beep - with the headlights shining bright and staying on until the beeping ends, and there are no more to light up. The button on the left when pressed with make a start up engine sounds then continue to make a running engine noise for approximately 20 seconds. In that time, again the headlights will continuously stay on until the sound stops, so when either button is pressed, the headlights will come on. This Land Rover takes 3 AAA batteries (included), and to install them you'll need too unscrew the battery compartment using a Philips screwdriver underneath and replace the batteries there. That being said, we don't recommend you get this toy wet or it will no longer work with exposure to moisture - this would become hazardous. If you're familiar with Bruder Land Rovers then you probably want to know if you can turn the wheels on the Britains Big Farm Land Rover. And that's a resounding yes, you can steer the wheels on Big Farm Land Rovers. To do so you can manually turn the front wheels using there hands, though incredibly, you can also turn the wheels by turning the steering wheel from within the driver's cabin. As fun as this sounds, we have to say this is tricky, access to the cab happens from the hole above or from the windowless doors. But access from either is really tight and well hard for adults, it can still be a pain for kids. Its up to them though, the may choose to use the steering wheel, turn the wheels by hand or just drive around the toy Land Rover without turning the wheels at all. You certainly can't have a Britains Big Farm Land Rover without the ability to tow along matching Big Farm trailers, and you can do just that with these vehicles. Using a Land Rover toy as a standalone model its just a simple hoop for the trailers to be towed, and doesn't stick out to far to be a nuisance. But there's a catch, which ever Britains Big Farm trailer you may wish to match up with, there come with a tow bar with an additional fixing. This fixing is used to go with or without the trailer depending on what it needs to be able to hitch onto the tow bar. Hitch and tow bar are not universal, so need addition fixing to be able to work with each other. We've so far talked about what the Britains Big Farm Land Rovers can do, but let's talk about what these models can't do. Like similar Land Rovers, you cannot open the driving cabin doors, you can pull down the tailgate door, but not the drivers doors. You can pull off the metal effect canopy, but you cannot remove the spare wheel under the canopy - attempting to remove it may cause it to break. Unfortunately, you can't open the bonnet to inspect the engine either; as nice as this would of been, its only the rear tailgate door that opens. And yes, it will fit in with all 1:16th scale farm toys with Big Farm or Bruder. 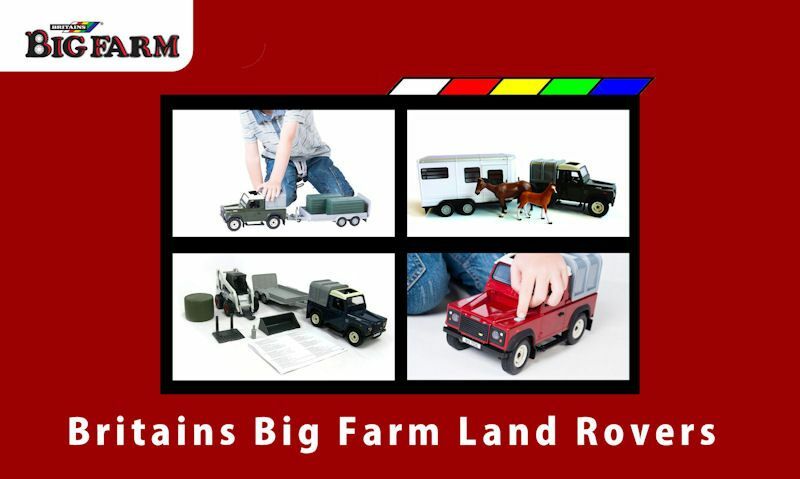 We've guided you through the top features the Big Farm Land Rovers have, and will apply to all the models in the series. But let's tell you what is indeed available in the collection, and well you're not spoilt for choice, there's a few Land Rovers that may be of interest. Taking into consideration all featured we've laid out above, when going for a standalone model, consider buying a trailer for it later. Likewise, if going for a Land Rover with trailer, make sure its the one you want, but again, depending on your budget you can expand the trailer range later. When you think of the great British countryside with a Land Rover heading down the country lane, your mind just may go to the model looking just like this one. And this classic Land Rover can be instantly turned to an open back by removing the canopy. But driving your farm Land Rover isn't for fun, there's work to be done around the yard. So this matching trailer with working rear ramp is ideal and so is lugging around the two big green silage bales - attach trailer by simply hooking over hitch. 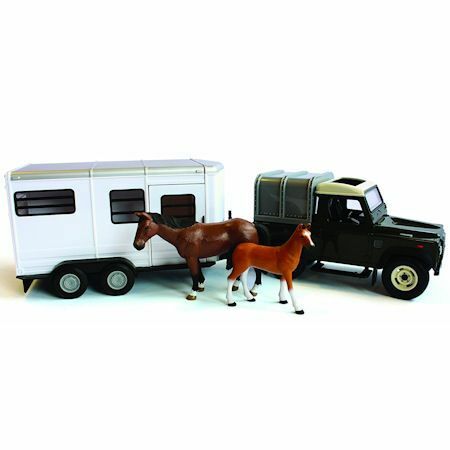 This model is actually the same one featured above, only it comes with a horse trailer and a set of two horse figures - a mare and foal. But as usual the canopy can by removed for an open back version and the trailer easily attaches to the rear hitch on the Rover. If you-re operating a stable or equestrian scene in 1:16 scale, then this set is perfect for the young horse enthusiasts. What better way to transport your Big Farm horse in luxury from the stable to events and shows in style. Wow, way more kit in this set so it's little more expensive, but there's sure enough equipment here to keep the young one busy. 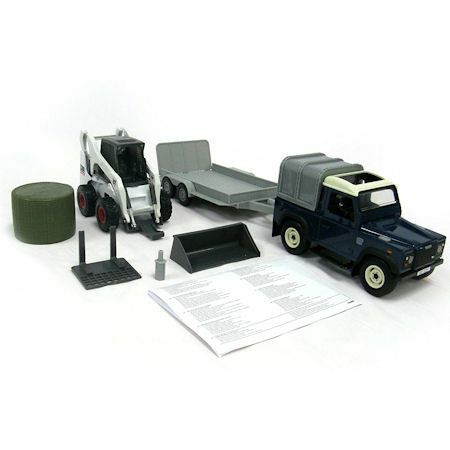 This set includes a trailer with rear ramp, skid steer with functioning arms and two optional attachments and a rounded bale. The reason the Land Rover is towing this skid steer is because there's work back at the farmyard to be done. The farmer has rented it for the day for moving muck and even bales off the field - and these two attachments are each used for one and the other. Big Farm's only stand alone Land Rover Defender, but in a striking red and metal effect canopy. As usual with Britains, you can remove the canopy, steer the wheels, and press a button for lights and sounds. This vehicle as a stand alone model is ideal for matching up Britains trailers for your own needs, with the option to expand with any implements you may need later. And thankfully, Britains have produced a few trailers that are used with road vehicles - not just tractors.